A home sits in ruin on Lava Dr. Sunday, July 8, 2018, in El Jebel after being destroyed by the Lake Christine Fire. Arrest warrants have been issued for both people suspected in starting the Lake Christine Fire at the Basalt shooting range, Bruce Brown, district attorney in the Fifth Judicial District confirmed Monday. Brown told the Vail Daily the warrants were issued for fourth-degree arson, endangering a person, for Richard Karl Miller, 23, and Allison Sarah Marcus, 22, both of El Jebel. As of Monday morning they hadn’t been arrested or turned themselves in, Brown said. Once they are in custody, the DA’s Office will ask that bond be set at $7,500. Brown said the investigation is ongoing because the fire is still burning. The ultimate charges in the case could change from fourth-degree arson. Marcus and Miller were allegedly at the shooting range firing tracer rounds shortly before 6 p.m. Tuesday. Use of tracer ammunition is illegal. Meanwhile, the firefighting operation continues. The fire has grown to 5,916 acres or 9.25 square miles, according to the Northern Rockies Incident Management Team. It is considered 31 percent contained. There are 583 fire personnel, including 16 hand crews, 35 engines, three water tenders and five helicopters assigned to the fire. “We have about 200 people being de-mobilized today,” said Ashley Nettles, PIO for the management team. They will go home or be assigned to a different fire. An estimated 30 homes remain evacuated, most of them east of Upper Cattle Creek Road in Missouri Heights. That includes the Vista Hi area, where Basalt firefighter Cleve William’s house burned down on the morning of July 5. Additional homes are still evacuated in the higher neighborhoods of Basalt. 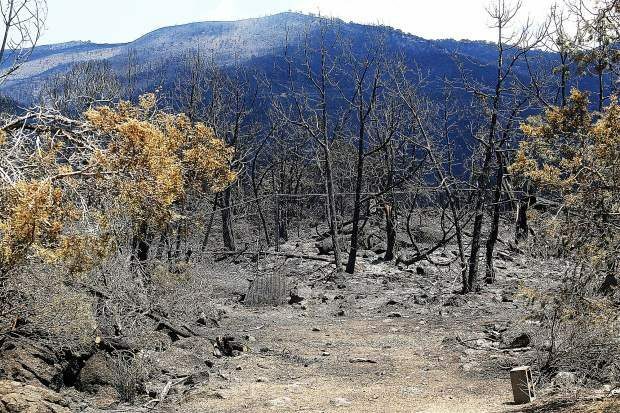 The northern end of the fire — heading away from developed areas and the dark timber of Basalt Mountain — is uncontrolled in steep, rugged terrain. It is likely to continue to spread in that direction “for some time,” according to the management team.